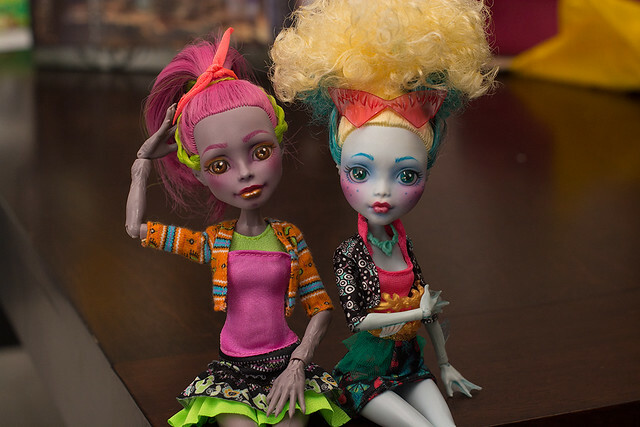 And here are Mari and Lagoona all finished up! I learned a lot during this process (mostly, do not use painter's tape. Buy more little rubberbands instead) and will apply that to other customs I'm working on! And here is the completed Toralei! I'm pretty pleased with how she came out, but I need to work on adding more eyelashes to the top lid in a convincing fashion. 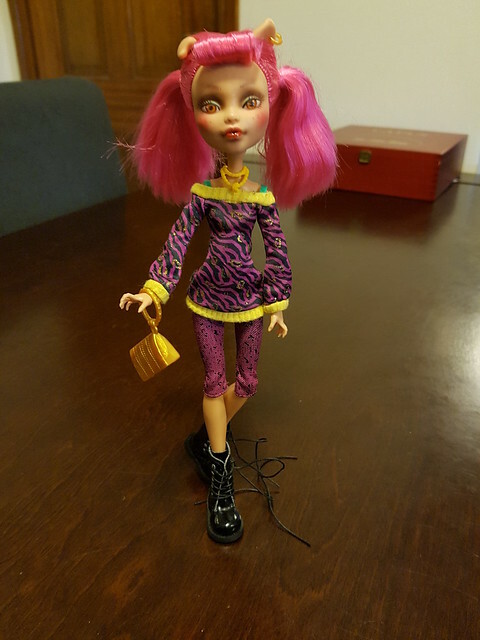 I was going to add false lashes to her with a bit of glue, but the ones I have are human proportions and don't work well (I thought I had some doll-sized ones, but must be mis-remembering). At any rate, she's looking pretty good! It's been a while since I updated, but I finally finished that Dance Class Howleen on her adult body! Now she just needs some new clothes. I've also made two wigs for an upcoming custom Honey. I'd planned to re-root her, but thought maybe wigs would be more fun! I'm also considering giving her glass/inset eyes, but have yet to pop her head open to give that a go. I worked a bit more on her rose sleeves while the MSC was in transit, but haven't been able to seal my progress to move forward. Excited to continue work on that now. Catrine is finished and (temporarily) redressed! She started as a Shriekwrecked Catrine, was rebodied and rerooted, and partially repainted with a pale pink lip with pearl pigment powder and matte varnish sealant. 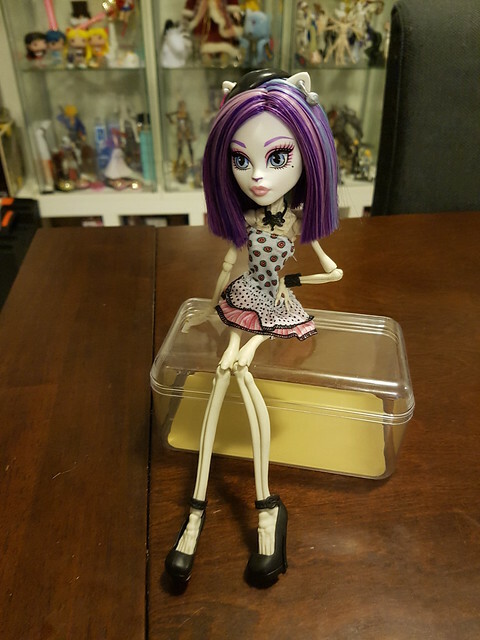 She's currently been redressed in a mix of stock to suit her new hair colour and to show off her new skelekitty bod! Venus is back on her body and will be getting a touch-up to her flocking and a new face-up, just as soon as the flocking powder arrives. In the mean time, I felt bad leaving her sitting around nekkid. Finished re-rooting Swim Class Rochelle in black saran and hot pink mystery hair. 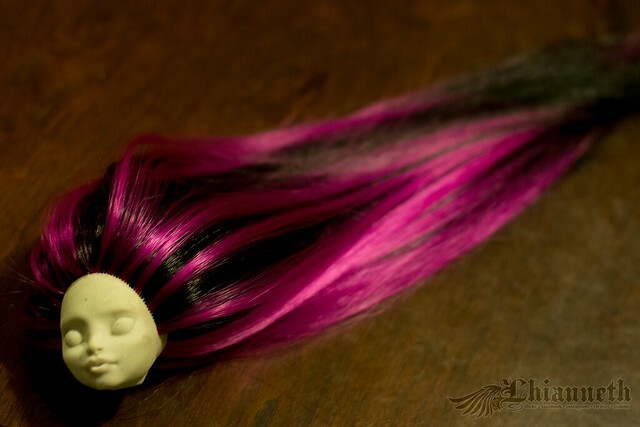 She turned out quite well, though there were a few complications along the way (her scalp split during the de-hairing process; I patched it with two coats of liquid fusion before rerooting, but the part line split open again while I was working). 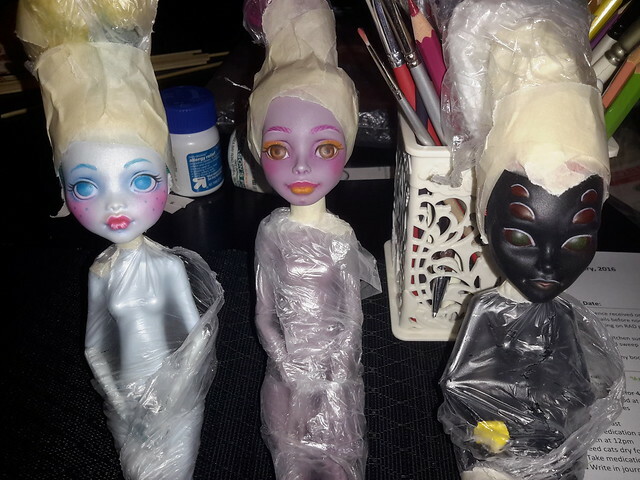 She'll get an extra coat of glue to the inside of her little noggin, compared to other dolls I've rehaired. Rochelle Number Two (Dance Class Rochelle) will be on her way next. My friend started her while she was here visiting, but didn't get to complete her because we were so busy, so I'll finish her up and ship her over to the US with a new neon green do and some cute matching lipstick. Re: Customs WIP - Critique and tips? I think your dolls are lovely and it seems that's the design you are looking for, with the bright colors. I guess the one suggestion I'd give you is to choose an area or two you'd like to focus on. Like cheeks and brows. Or just the lips. Or the eyes. My aunt thought me some stuff about make-up, that may hold true for the dolls too,. And the same goes for fashion. Lol. Enhance your features 1 at a time. No I don't think you should scrap these dolls. They are beautiful and will look incredible once they are finished. And don't be so hard on your self. Your doing an wonderful job for your first time. Thanks! I took what you said about focusing on one thing on board and did a bit more work. For Lagoona, I decided to skip the gold shadow, and put the emphasis on her cheeks and freckles. I'll finish her eyes up in the next coat or two. For Marisol, I focused on her lips and eye shadow, and will let the MSC fade her cheeks out a bit more. 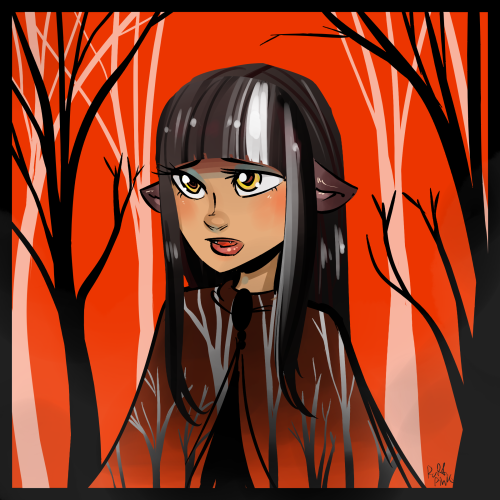 Also started on a Wydowna, but I'm not sure how well I like the idea I have for her, so she may change. Right now, my plan is to give her gold irises and lips, but red for the rest. I don't have any customizing advice (as I've never done it), but I love the work you have so far! I'll put together a timeline thread when I'm finished. Or if anyone has further suggestions/critique on things to change or fix, I'll post here with updates on that advice. 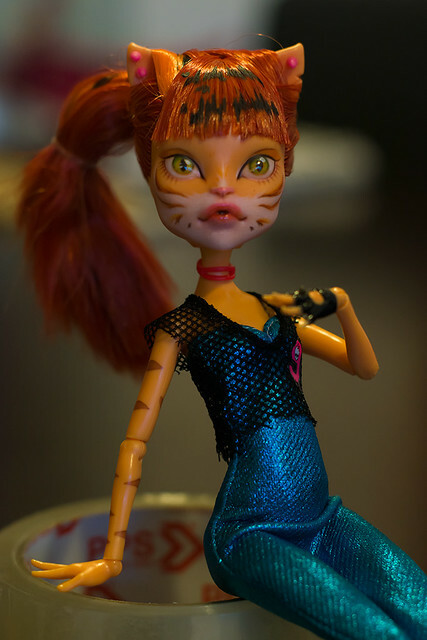 I really love how bright and bold these dolls are! There's a good amount of stuff going on with each of them, and it keeps them very interesting. It's a lot different than most repaints you see, which can be very pale and soft. I think they look stupendous, Lhia! Something that I've learned about face-ups is that those first few layers of blush usually look more intense and "heavy-handed" until you start working on the pencil layers. Then the blushing becomes somewhat muted by the darker, more saturated pencils and doesn't seem so intense anymore. I think that's definitely the case here. Your first layer seemed dense, but in that third photo the blush work is being balanced out by your pencils. You're doing a fantastic job! Keep on truckin'! I can't wait to see them when they're finished! You're doing hexillent! I love Mari's lips, and Lagoona's colors are magical. 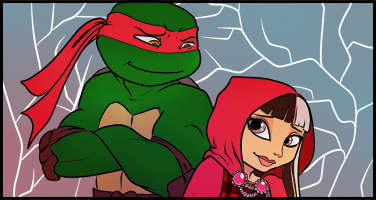 I can't wait to see what you are doing with Wydowna, she's going to look awesome. Wow! Those are amazing! And for first attempts? Wow! The only thing i can even possibly see to make any better is that Mari's eyes look almost wall-eyed? I think its a trick of the light, but I cant really tell But wow! And I LOVE the direction you are taking Lagoona and Wydowna! Both look spectacular!! I'm in love with your designs! Okay, i couldnt tell Then these truly are perfect! Trick of the light mostly, aye! But the one eye has a slightly wider top to the iris than the other (d'oh), which means she technically is a tiny bit wonk after all. But practice makes perfect, right? I have a bunch more dolls lined up to receive new faces. ... just as soon as the humidity drops down below 75% again. Which it won't for a few days. edit: Lucky me, the humidity dropped to 53% this afternoon for a few hours, so I was able to finish up Marisol and Lagoona! I've changed the thread topic to be a catch-all for future customs. I love that Lagoona! So pretty and innocent looking! Adorable. Thank you! 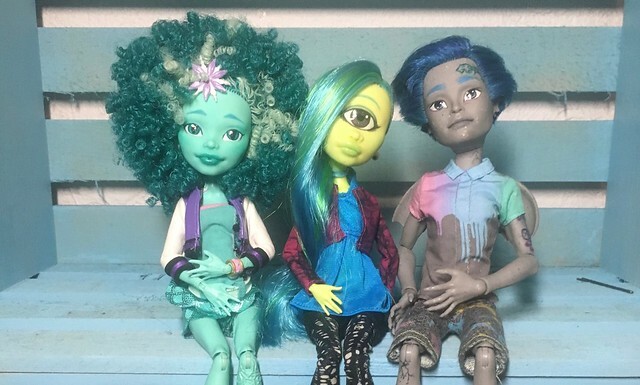 I thought for sure that Mari would be my fave of the two, but Lagoona's cheeks just came out so sweet-looking! Omg!! They're beautiful! I can't believe those are your first customs, they're seriously gorgeous! 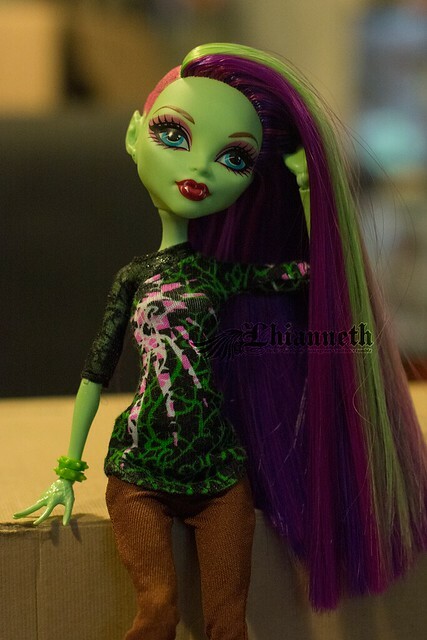 I especially love the bright colors on Lagoona. I've popped about 20 doll heads off in the last year or so, and erased nearly as many faces, but these two are the first I've had the guts to take pencil and pastel to. Once upon a time, I did a couple of pony customs, but they were super shoddy, unsealed, and executed with craft acrylics. I've just watched a lot of tutorials from different people since I decided I might want to start doing customs. I really liked the end result of your dollies! And that WIP Toralei, my! She's so beautiful and more amazingly cat looking! Love her so much!